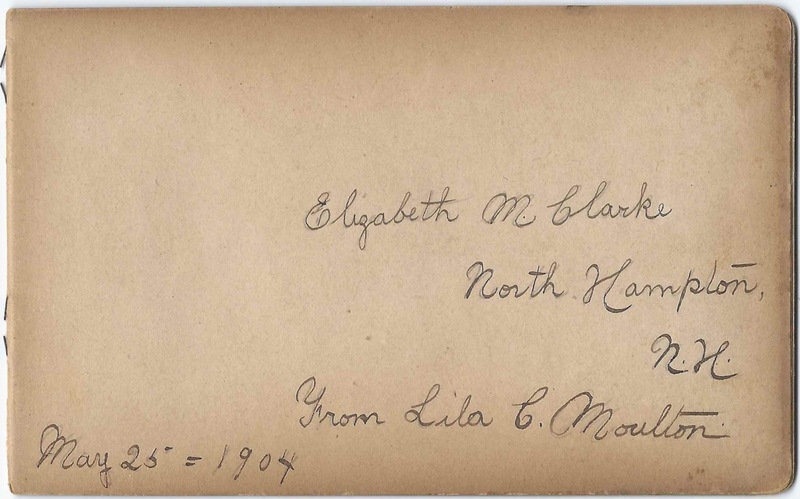 1904-1910 autograph album of Elizabeth M. Clark of North Hampton, New Hampshire. The title page and perhaps other pages are missing at the beginning of the album but one page was inscribed to the owner, and several pages were signed by relatives, which taken together, also identified the owner as Elizabeth M. Clark. The page below was inscribed to Elizabeth M. Clark of North Hampton, New Hampshire, by Lila C. Moulton, who signed her page on May 25, 1904. 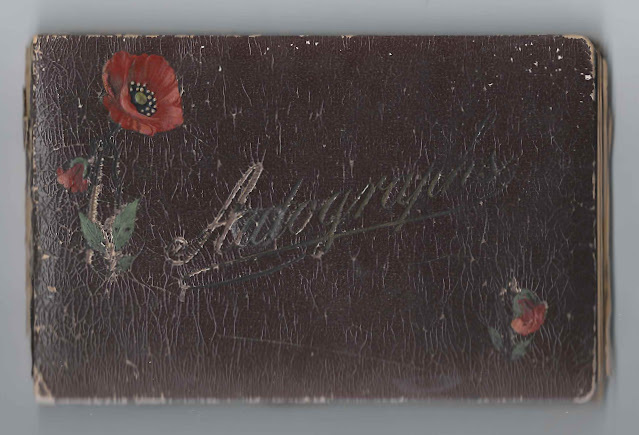 The album is approximately 6-1/2" x 4-1/4" and contains the sentiments of 49 of Elizabeth's relatives, friends and schoolmates. An alphabetical list of the senders appears at the end of this post. Elizabeth M. Clark was born about 1895 at North Hampton, Massachusetts, the daughter of Albion S. and Ida May (Cammett) Cousens Clark. Albion S. Clark was the son of Thomas and Mary H. (Day) Clark. Ida May (Cammett) Cousens Clark was the daughter of Stephen and Sarah Eunice (Healey) Cammett. One confusing fact is that there is a death record for a Mary Lizzie Clark, daughter of Albion and Ida (Cammett) Clark, born 25 May 1895, who died 13 days later, according to a Massachusetts Death Record. Possibly Elizabeth M. Clark was a surviving twin? Elizabeth's father, Albion S. Clark, was first married to, I think, Elizabeth Ann (Otis) Clark; they had daughter Ethel Maude Clark, born 11 December 1881 at North Berwick, Maine. 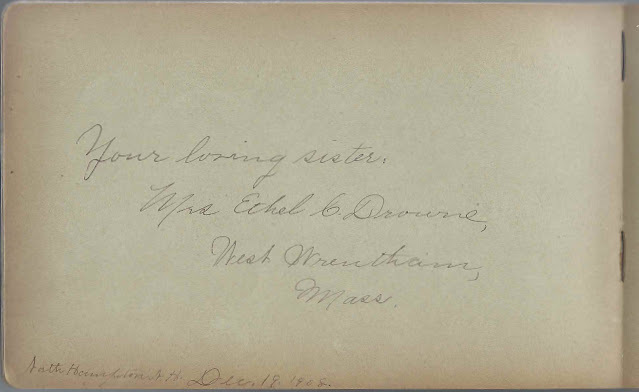 Ethel, then living at West Wrentham, Massachusetts and married to Luman Archie Drowne, signed a page in Elizabeth's album at North Hampton, New Hampshire, on December 19, 1908. Elizabeth's mother, Ida May (Cammett) Cousens Clark had two daughters with her first husband John Otis Cousens, son of Bradford and Ruth C. (Ricker) Cousens. They were Octavia Hill Cousens, born 31 October 1882 at Biddeford, Maine, and Ruth Belle Cousens, born 21 November 1885 at Biddeford, Maine. 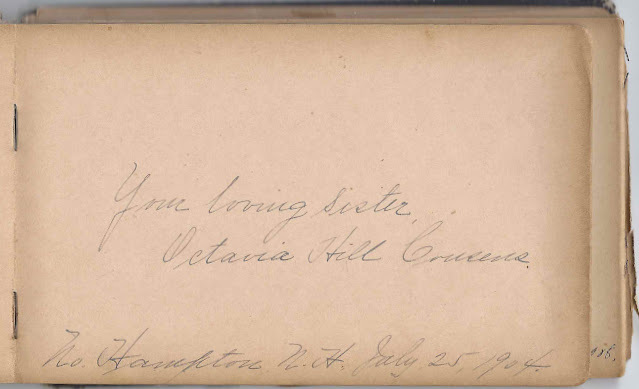 Octavia signed a page in Elizabeth's album at North Hampton, New Hampshire, on July 25, 1904. 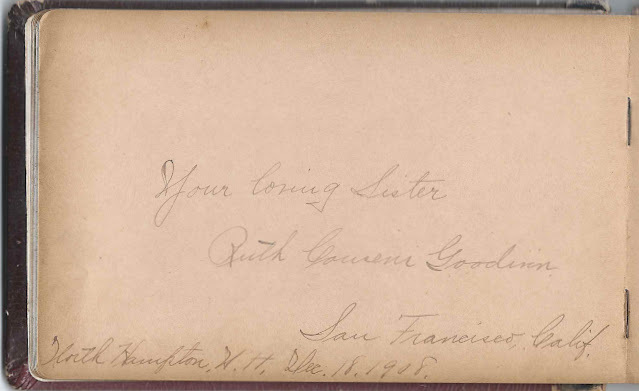 Ruth Belle (Cousens) Goodwin, by then married to Daniel G. Goodwin and living at San Francisco, signed a page at North Hampton, New Hampshire, on December 18, 1908. I lost track of Elizabeth M. Clark after the 1910 Census of North Hampton, New Hampshire. She may have been the Elizabeth M. Clark who married Henry Tasker. Octavia Hill Cousens, signed at North Hampton, New Hampshire, on July 25, 1904; older sister of Elizabeth M. Clark, album owner. They shared a mother, Ida May (Cammett) Cousens Clark. 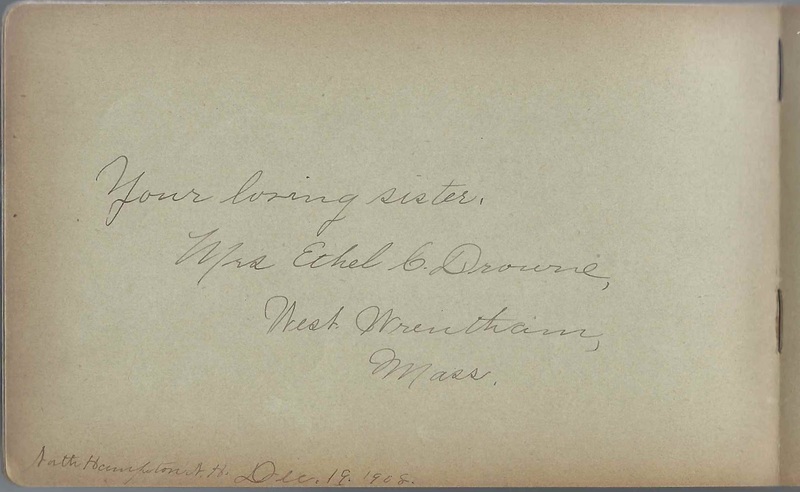 Mrs. Ethel C. Drowne of West Wrentham, Massachusetts, signed at North Hampton, Massachusetts, on December 19, 1908. Elizabeth's half-sister Ethel (Clark) Drowne. They shared a father, Albion Clark. Ruth Cousens Goodwin of San Francisco, California, signed at North Hampton, New Hampshire, on December 18, 1908. Ruth Bell (Cousens) Goodwin, older half-sister of Elizabeth M. Clark, album owner. They shared a mother, Ida May (Cammett) Cousens Clark.